"I think this is one small battle in a bigger tech trade war between the U.S. and China." This is the comment of Cyrus Mewawalla, speaking to BBC about Apple’s recent move to host Chinese users' iCloud accounts in a Chinese data centre, compelled by new laws. The interview took place 2 months before Donald Trump’s decision of introducing tariffs on something close to 1300 Chinese imported products, a decision which proves Mewawalla’s statement right. The head of investment research at GlobalData referred to Bejing’s new laws imposing data cloud services offered to citizens to be stored and operated by Chinese companies. As a consequence, it will be very easy for Chinese government to access to iCloud data that Apple is now forced to hand over. The same is requested to all the other foreign companies operating in China, which have now to face a difficult and maybe impossible choice: to comply with the new regulation despite the risk of data theft and the violation of costumers’ privacy, or to be excluded from the giant Chinese market. For example, if Apple hadn’t given in to the law it would have been obliged to renounce to 20% of its total yearly revenue coming from the country. But this is not the first battle: the tech trade war started in 2009 when China banned Facebook, Google and Twitter, and continued with HUAWEI and ZTE being denied to sell equipment to telecom operators in the USA. And there aren’t any clues that things are going to change with Donald Trump taking a hard line against Chinese investments and acquisitions towards U.S. companies, in particular the ones belonging to strategic sectors for national security. A new chapter of this fight may be coming up after Alipay’s hard push into the American market. The Alibaba’s affiliate is one of the biggest providers of cashless payment services worldwide and its attempt to get stronger on U.S. ground will probably find a tough opposition. However, the company, which is currently increasing the number of partner stores and businesses overseas in order to offer more possibilities to Chinese tourists, may prove itself to be solid enough to face any threats. 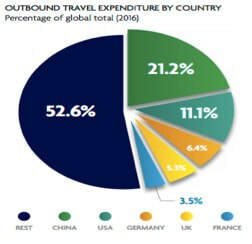 In fact, according to the World Tourism Organization, about 135 million Chinese outbound tourists spent a total of $261 billion in 2016 and most of them mainly used Alipay or their nearest competitor WeChat for their purchases. It would not be easy for any government to block Alipay since, according to Nielsen and Alipay's Outbound Chinese Tourism and Consumption Trends survey, 65% of Chinese tourists use mobile payment platforms while abroad and spend on average $762 per person towards shopping on their overseas trip-meanwhile, non-Chinese tourists, spend an average of $486. Even if the U.S might accept such a loss to help their companies, many other countries highly dependent on tourism like Switzerland or Italy simply will not be able to. That is why Alipay and Wechat’s popularity will keep increasing, even more now after the two companies announced a partnership with tax rebates companies for the implementation of a new service which will allow Chinese people to get instant tax rebates on purchases made in foreign countries. In fact, lining up at the airport to get tax refund modules processed is one of the most annoying things that seem to be preventing them from spending more. Such an innovation should induce much more people to switch from traditional payments systems to cashless systems. These companies’ next goal is to take a big share of western users, who are still quite underdeveloped as cashless payers. And, once you notice that Alipay, along with WeChat, has over 1 billion users worldwide- compared to Paypal's 203 million active accounts in 2017- you will understand that it is very unlikely that any western company will be able to compete with these two giants. Tencent launched WeChat Pay services in Europe in July 2017, two years after Alipay rolled out its service in the region in 2015, while both entered US market through a partnership with local payment solution providers like First Data and CITCON. It seems that even Donald Trump will not succeed in limiting their expansion, even if it is now clear that no one can predict what the President would eventually be able to do in a desperate attempt to overturn the trend. China is currently winning the tech war and while it is good for worldwide technological development we should not underestimate the possible downsides. In particular, it is important to remember that Alipay and WeChat have become what they are today thanks to a huge support by their government, which also banned almost all the nearer foreign competitors: just remember that WeChat was born as an instant messaging company and that its main competitor Whatapp was excluded from Chinese market last year. This kind of unfair measures go against the global free market, the same that is now being exploited by the two companies to expand in the rest of the world. Moreover, as said before, the strong link between these companies and the Chinese central government might turn out to be a serious threat to users’ privacy and to countries’ national security and I think this is something western countries should deal with as soon as possible.